The Cherokee community is grateful for blessings and challenges that each season brings. This is modern Native American life as told by an enrolled citizen of the Cherokee Nation. The word otsaliheliga (oh-jah-LEE-hay-lee-gah) is used by members of the Cherokee Nation to express gratitude. Beginning in the fall with the new year and ending in summer, follow a full Cherokee year of celebrations and experiences. Written by a citizen of the Cherokee Nation, this look at one group of Native Americans is appended with a glossary and the complete Cherokee syllabary, originally created by Sequoyah. Traci Sorell writes fiction and nonfiction for children featuring contemporary characters and compelling biographies. She is an enrolled citizen of the Cherokee Nation and lives in northeastern Oklahoma, where her tribe is located. * According to storyteller Sorell, the Cherokee people always express gratitude for the little things they are given by saying the phrase, "Otsaliheliga," or "we are grateful." Raised in the Cherokee Nation, Sorell intentionally crafts a narrative that simultaneously embraces modernity and a traditional presentation of Cherokee community and way of life. Throughout, the measured text reminds readers that in all things "we say otsaliheliga." Colorful, folk art-style illustrations show Cherokee people during ceremonies, in family gatherings large and small, and outdoors enjoying each of the four seasons, always expressing gratitude. The scenes are contemporary; one shows a father taking care of his children, engaging in a positive parenting role, while another depicts a family seeing off a relative who is leaving for deployment in the military, underscoring that Cherokee people serve their country. Children participate in rites and in family outings with adults, and they also play traditional games such as stickball and plant strawberries, a practice that reminds their people to embrace peace with one another. The variety of skin tones represented in the illustrations likewise depicts a present-day reflection of the diversity that exists within the Cherokee people. Occasional Cherokee words are written in Romanized form, phonetically, in Cherokee characters, and in English—a lovely grace note. A gracious, warm, and loving celebration of community and gratitude. * Cherokee people say otsaliheliga to express gratitude. It is a reminder to celebrate our blessings and reflect on struggles — daily, throughout the year, and across the seasons.” An extended family engages with activities and traditions that express gratitude and carry on Cherokee history and culture, such as stomp dancing at the Great New Moon Ceremony, basket weaving, making corn-husk dolls, and playing stickball. The book underscores the importance of traditions and carrying on a Cherokee way of life while simultaneously incorporating modernity and challenging dated media images of Indigenous people. Here, a father sporting an earring and a topknot minds the children; a family bids goodbye to a clan relative who deploys with the U.S. military. Skin colors range from light to dark, visually underscoring the book’s message of diversity and inclusion. Staying firmly upbeat and idyllic, the cheerful, richly detailed gouache illustrations in bright, saturated colors cycle through the seasons, beginning with the Cherokee New Year in autumn. The text includes several Cherokee words; a line of text in a smaller font along the bottom of the page provides each word as written in the English alphabet, its phonetic pronunciation, the word as written in the Cherokee alphabet, and its definition. A glossary, an author’s note on Cherokee culture, and a complete Cherokee syllabary conclude this attractive and informative book. * Sorell, a citizen of the Cherokee Nation, offers readers a look at contemporary Cherokee life as she follows a family through the seasons of the year as they take part in ceremonies and festivals. The book opens, “Cherokee people say otsaliheliga to express gratitude. It is a reminder to celebrate our blessings and reflect on struggles—daily, throughout the year….” Beginning in the fall (uligohvsdi) with the Cherokee New Year, a variety of rituals and cultural symbols are introduced, all in spare, lyrical, accessible language. Traditional foods, crafts, and songs are part of the engaging narrative, as is the refrain, “we say otsaliheliga.” Once through the calendar, Sorell circles back to the Cherokee National Holiday (Labor Day weekend), “when we recall the ancestors’ sacrifices to preserve our way of life…. to celebrate nulistanidolv, history, and listen to our tribal leaders speak.” Cherokee words are presented both phonetically and written in the Cherokee syllabary. Lessac’s lovely gouache folk-art style paintings bring the scenes to life. Back matter includes a description of the various ceremonies, notes, and a page devoted to the Cherokee ­syllabary. VERDICT This informative and authentic introduction to a thriving ancestral and ceremonial way of life is perfect for holiday and family sharing. 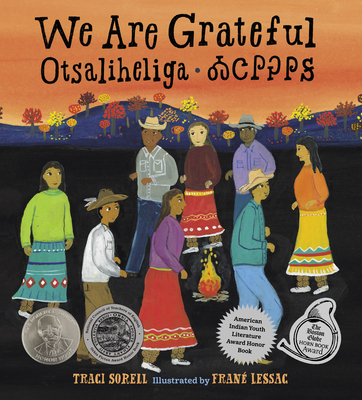 * Cherokee poet Traci Sorell makes her picture book debut with We Are Grateful: Otsaliheliga, illustrated by theprolific Frané Lessac. "Cherokee people say otsaliheliga to express gratitude. It is a reminder to celebrate our blessings and reflect onstruggles--daily, throughout the year, and across the seasons." With seasonal chapter headings in both English andTsalagi, Cherokee, Sorell takes the reader through a year in the life of contemporary citizens of the CherokeeNation. Using the refrain "we say otsaliheliga" (pronounced oh-jah-LEE-hay-lee-gah), each season is given specialjoys, sorrows and celebrations both specific and generic, personal and communal. In autumn (uligohvsdi), gratitude is voiced as shell shakers dance around the fire during the Great New Moon Ceremony; it is expressed ascitizens of the Cherokee Nation clean their homes, don new clothes and feast to welcome the Cherokee New Year; it is communicated throughacts of remembrance for "ancestors who suffered hardship and loss on the Trail of Tears." In winter (gola), "[a]s bears sleep deep and snowblankets the ground," the large, tightly knit community is thankful for the stories of elders and for traditional lullabies.Lessac's folk art-style gouache illustrations depict the diversity of contemporary life experiences described in Sorell's text. On one spread, thefamily hugs a "clan relative" dressed in fatigues as he heads off "to serve our country"; on another, children play in a cornfield as "the cropsmature and the sun scorches." In Sorell's author note, she says "Cherokee culture places a strong emphasis on expressing gratitude tounelanvhi... literally 'the one who provides all,' " as well as for "one another." An elegant representation of this concept, We Are Grateful has the ability to resonate with any reader: "Otsaliheliga for all who came before us, those here now, and those yet to come." In Cherokee culture, Sorell shares, the expression of gratitude is part of daily life and extends from elaborate celebrations to struggles to ordinary life moments. She organizes her debut picture book by seasons, beginning with the fall, which is a time for collecting foliage for basket making and remembering those who suffered on the Trail of Tears. It also contains the Cherokee New Year and the Great New Moon Ceremony, a celebration of renewal and coming together. Each season section starts with the name of the season in Cherokee, an expression of gratitude for the change in nature, and subsequent pages describing community activities pertinent to that season. Lessac's folkloric illustration in bright gouache colors stands in pleasing contrast to the book’s contemporary feel and setting. The text reads like poetry but has a gentle instructional dimension to it. On many pages, Cherokee words are accompanied by English translations, pronunciation guides, and Cherokee syllabary. Back matter contains relevant explanations and provides good context, and the author's note sets past misrepresentations right.